Tortilla Soup is a movie, in case you don’t know, as well as a delicious dish. Our #4 Daughter showed it to me, and I’m so glad she did! It’s a feel-good movie that’s also a feel-deeply movie. And, although it isn’t a musical, it has a great soundtrack. I lucked onto this soundtrack CD, originally a promotional item, so I don’t know if yours would be the same as mine. I hope so, because look what came in it. 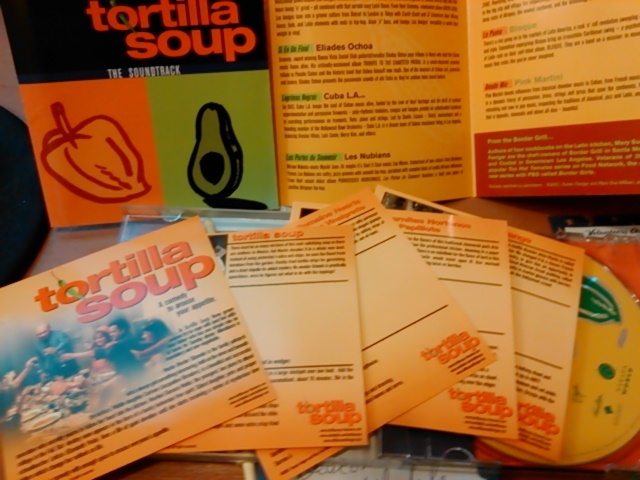 Yes, those are RECIPE CARDS for dishes in the movie, including the titular Tortilla Soup. How awesome is that? Way, that’s how! If you want a recipe, do yourself a favor and look at this one from The Pioneer Woman Cooks. If you don’t want a recipe, do yourself a favor and look at this one anyway. It’s beautiful and I love the woman’s humor. Now let’s sit back and enjoy one of the songs from the movie. You’re welcome. A WRITING PROMPT FOR YOU: What’s your favorite soup? What’s your main character’s favorite soup? This entry was posted in April A-to-Z Challenge, April A-to-Z Challenge 2014, Food. Tagged songs, tortilla soup. Hmmm. Pioneer Woman’s soup looks delicious! My favorirte…..hmm. I watched Julia Child make V-choise one afternoon. I followed her directions, and it was scrumptuous. She said that during The War, they called it V-choise because of the Vichy government in Nazi-occupied France. You don’t learn stuff like that every day!